Looking for a quick fix for a date night or a fun holiday? Here's a simple "how to" that's quick and easy to create. 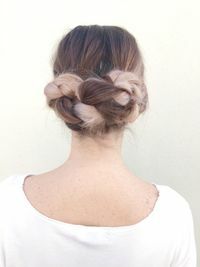 The best part about this updo is that the more lived in it looks, the better! Step 1. 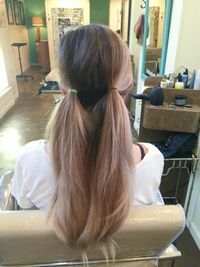 Pull the hair into two low back ponies. Make sure to keep it messy and tease it a bit at the crown so you can hide the part. You can part the front of your hair on the side or the middle. It's your choice! Step 3. 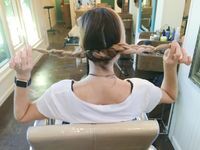 Tie both braids into a knot. Then make sure to pin them next to where each pony tail starts. I usually like to wrap the braid around the pony to hide the rubber band. Step 4. 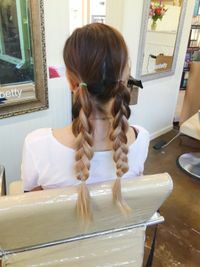 Pin and wrap the braids around each other and make sure to tuck in any loose ends. 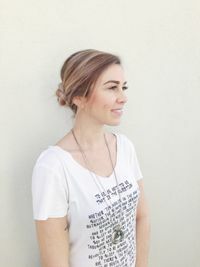 Play with your hair and make this style your own! 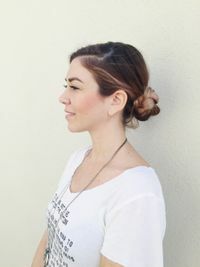 You can rock it out messy and loose or you can secure it tightly for a more formal look. Check out the video that we did with Studio512 that shows the live how-to version here.